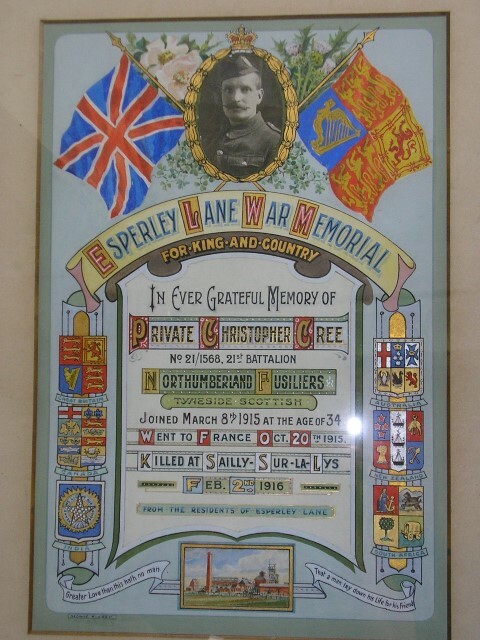 21/1568 Private Christopher Cree, 21st (Tyneside Scottish) Battalion, the Northumberland Fusiliers died of wounds 2 February 1916 and is buried at Sailly-sur-la-Lys Canadian Cemetery, France and is commemorated on Cockfield War Memorial. He was 38 years old, married to Elizabeth and they had 5 children. In 1901, the family lived at Oaks House, Evenwood and 23 year old Christopher worked as a coal miner (hewer). 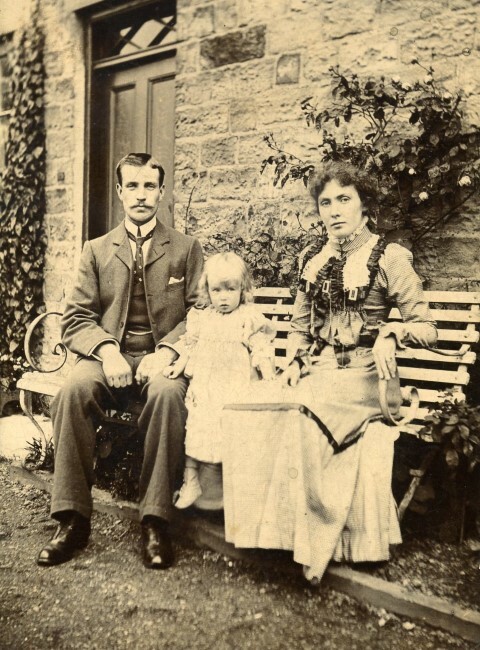 By 1911, the family lived at Esperley Lane, Cockfield and worked as a coal miner (hewer). 25 January: evening, half of the officers and NCO’s went into the trenches followed by the other half 27 January. 28 January: 5.30pm, the battalion proceeded by half companies into the line. 31 January: a very foggy night, the companies of the 21st Battalion rotated with B and D going into the line. 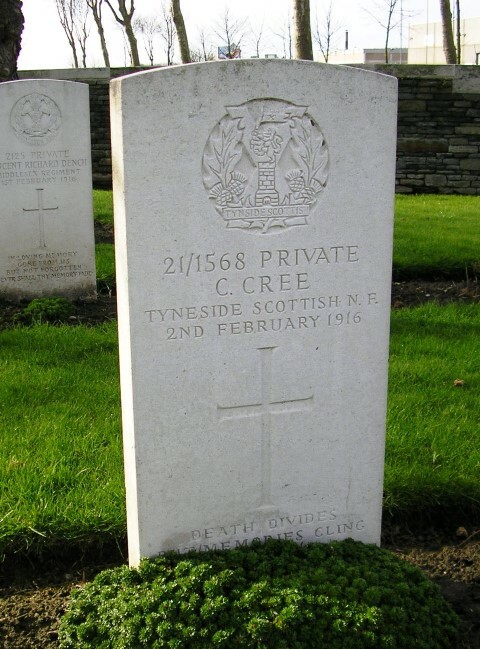 1 February: the battalion soon suffered its first fatality when 21/1568 Private Cree was wounded by a machine gun bullet whilst on a working party. 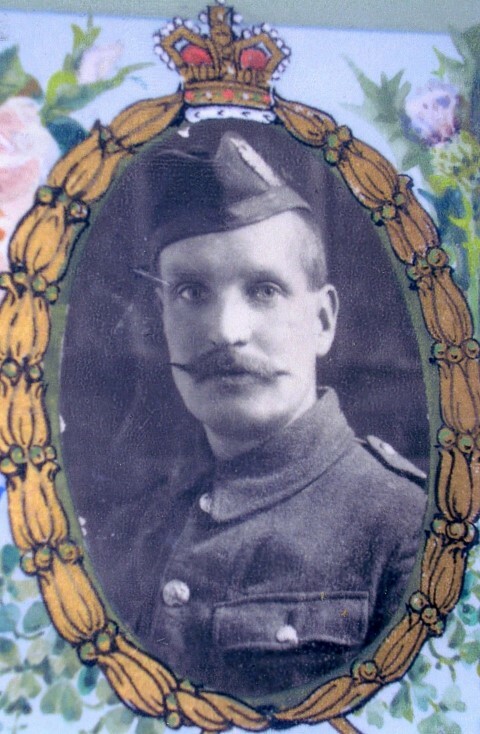 Private C. Cree was awarded the British War and Victory medals. Sailly-sur-la-Lys Canadian Cemetery: Private Christopher Cree is buried at grave reference II.G.159. The village of Sailly-sur-la-Lys lies approx. 7km west of Armentieres, Pas de Calais, France. The cemetery was begun by Canadian units in March 1915 and used as a front line cemetery until July 1916. It contains 313 Commonwealth burials of the First World War. 20 July 1920: The colours of the 2nd Battalion, Tyneside Scottish 21st Battalion Northumberland Fusiliers was “laid up.” The Morpeth Herald 7 October 1921 reported that the porch had been converted to a Chapel of Remembrance. 5 July 2009: The Chapel and the recently refurbished Colour were re-dedicated. He enlisted 8 March 1915 aged 34: According to the 1901 census, he would have been older, 36 or 37 years old. He went to France 20 October 1915: The Medal Roll indicates that he was awarded the Victory and the British Medal and not the 1914-15 Star. The Star was awarded to those who saw service in any theatre of war between 5 August 1914 and 31 December 1915. It must be assumed that he did not enter France until after 31 December 1915.